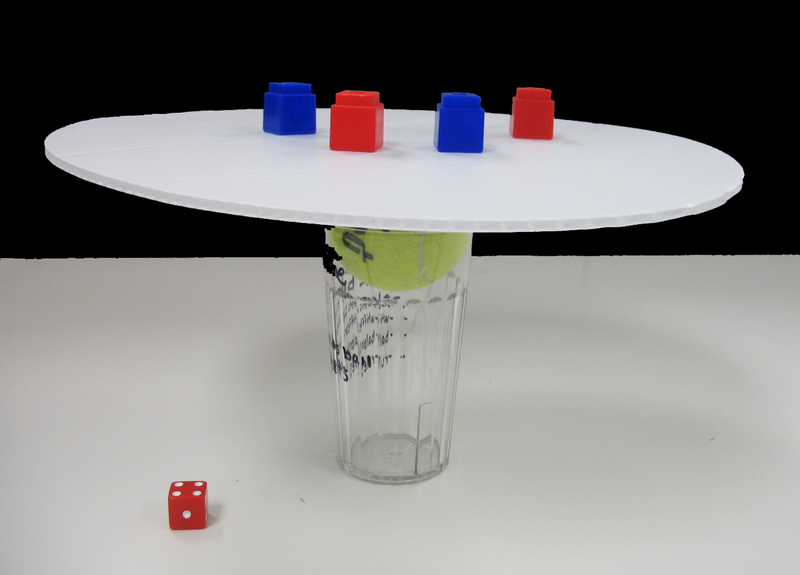 This is a very simple game to create with easily-found materials. Although a whiffle ball is specified because it seems to work well, a tennis ball or other ball can also be used. This game gives children the opportunity to experiment with balance as they try to figure out where to place their cubes so that the board does not tip far enough to cause the cubes to fall off. With experience, children will figure out that placing cubes closer to the center has the least effect on the incline of the cork board, while placing cubes closer to the edge has the greatest effect. They may also figure out that if cubes must be placed closer to the edge, the effect can be minimized by placing two cubes on opposite edges at the same time. One way to help children figure out these relationships is to draw concentric circles and diagonal lines on the board, as shown in the diagram below. This helps the children be more aware of where they are placing the pieces on the board.